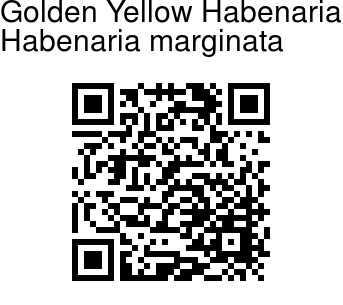 Habenaria species have small to large underground root tubers and erect stems 20 to 80 cm in length. Leaves are lance-shaped or ovate (round), and are borne either along the stem or only at the base. If basal, the leaves lie flat on the ground. The flowers are mostly green, white, yellow and green or white and green. In our species the flowers are resupinate (i.e. the lip faces down) and usually small, but there are some medium-sized or large-flowered species. Petals are either unlobed or deeply two-lobed. Lips are usually three-lobed and have a long spur that is sometimes swollen at the end. The column is frequently rather complicated, with long organs sticking out of it (stigma processes, lateral rostellum arms, anther canals) The plant is deciduous, with the entire above-ground part of the plant dying back each year. 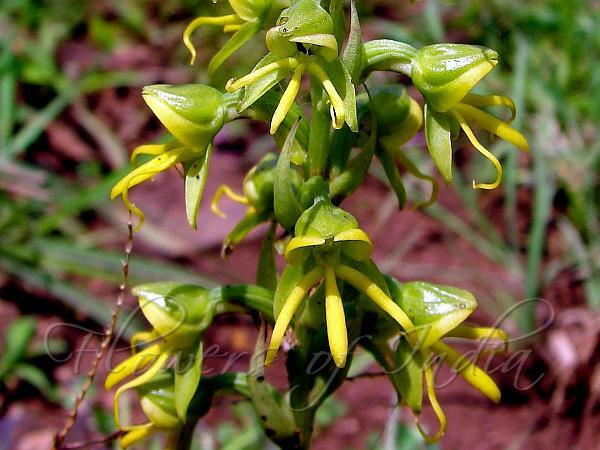 Golden Yellow Habenaria is found in the Himalayas, from Kashmir to Bhutan, Western Ghats, Burma, at altitudes of 500-1200 m.
Identification credit: Navendu Pagé, Pravin Kawale Photographed in Maharashtra.